Switch adapted art products for kids with special needs. Activate your adaptive switch and activate one of our fun spin art toys to create beautiful works of art. Great for special education classrooms. Our easy-to-use adapted art spinning kit enables users to create original works of art! Everyone’s an artist with our easy-to-use adapted art spinner. Adapted art toys for special needs and people with disabilities let everyone get creative. 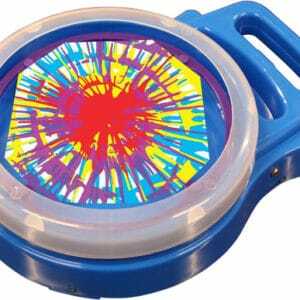 Our adaptive spin art and gear toys use an ability switch to make an artistic creation. 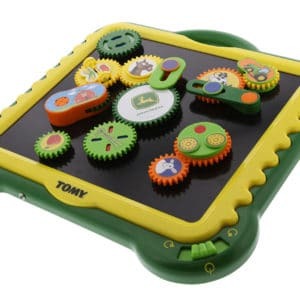 A gear toy enables the user to arrange interlocking gears and press their adaptive switch to make them move. 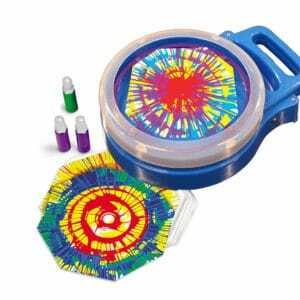 Meanwhile, spin art toys use markers or paint to swirl colors around a card. Switch adapted art toys help people with motor and intellectual disabilities express themselves. Adapting with a button lets people with most motor abilities create art with a little assistance and the press of a switch. Our mechanical art supplies allow the artist to choose their colors or elements and see them in action. Creating art gives people of all abilities the chance to learn about the world and communicate their ideas. Special education classrooms: Art is a vital aspect of learning for students of all grade levels. It offers a different perspective on the world for students who don’t learn in a traditional way. Our creative toys give students with special needs the chance to explore knowledge on their terms. They can also participate in art activities with students who use typical supplies like markers. As a result, the special needs students get to build their social and communication skills. Children with special needs: Children with down syndrome and other disabilities communicate in many ways. Those with nonverbal communication can use adapted art supplies for children with special needs to share ideas. 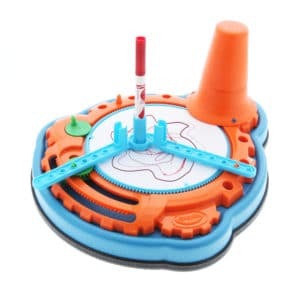 Unique toys like adaptive spin art gadgets give them another option for expressing themselves. People with disabilities: People of all ages can use adapted art toys to get creative. Our supplies suit people with motor disabilities like cerebral palsy who can press a button. They also let people with intellectual disabilities explore the world with art in a new way. Self-awareness: Your child gets to learn which colors and shapes they like when they make art. They can also discover their favorite supplies and art styles. Confidence: Children love to show off their creations to their loved ones. When you praise their work and take an interest in it, they receive a boost in self-esteem. Curiosity: Art makes a fantastic teaching tool that opens children up to new interests. For example, using a spin art machine to make a sun could start a conversation about the weather or space. At Enabling Devices, we specialize in creating custom adapted products for people with disabilities. If you have the perfect art supply in mind for your next project, contact our product development team. We can work together to find a solution that meets your needs. Call the development department at 800.832.8697 X320, or contact us online today.